Even as traditional media outreach approaches fade, one traditional communications constant remains immutable: We must find a point of distinction that separates us from others who also are trying to break through to our audiences. 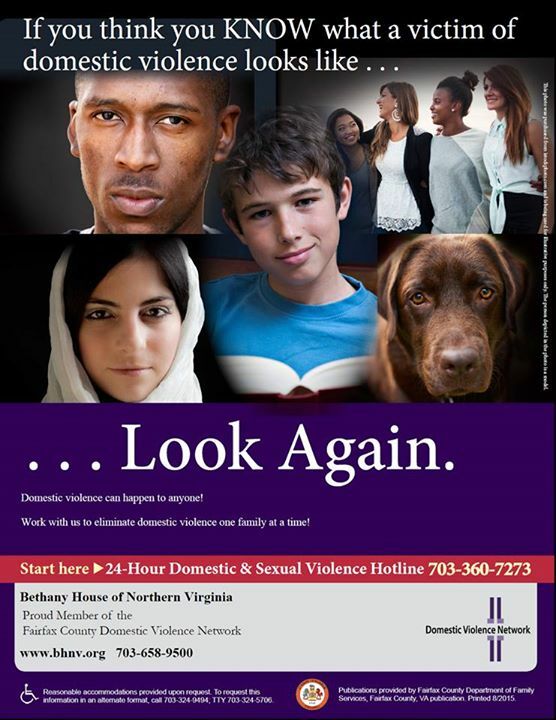 One way to do that is to toss a counterintuitive strategy at 'em — which we did in the case our assignment for Fairfax County, Virginia, as part of its "October is National Domestic Violence Awareness Month" public service campaign. In Fairfax, domestic violence is the leading cause of homicide. So it is a high-profile topic in this large, very affluent region just outside Washington ,D.C. But every month of every year is devoted to several causes, and in October the need to find a compelling message path for DV awareness is just as great as it would be any other month. Operating on the established premise that most people have in mind a particular stereotype of a victim of domestic violence — a married woman of age 30-45 — Tom Goodwin created a new theme that seems on the surface to be counterintuitive but that is, in fact, evidence-based: There IS NO stereotypical victim of DV. Tom's theme, "Look Again," was adopted by Fairfax County's Office for Women & Domestic and Sexual Violence Services as the theme for its fall PSA campaign. The County adapted Tom's theme to several visual treatments, such as the one depicted here. The PSA was run by numerous Domestic Violence organizations active in sheltering, educational programs, and other services — including rapid rehousing — across Fairfax County. Thomas Goodwin Communications, Inc. donated the thematic concept to the County as part of our ongoing community service commitment to local efforts to prevent and end homelessness and to fight domestic violence. Is the “traditional press release” dead? No. But the “traditional journalists” who read them might soon be. In the world of public relations recently there has been some buzz about whether the traditional news or press release is a thing of the past -- an age-old relic of typewriter days swept aside by punchy, fast-moving tweets and other social media avenues. For me, the answer to this question is that the traditional press release has always risked being ‘dead’ -- on arrival that is, if it is not part of a larger communications plan that takes into account the strategic imperatives we have discussed in this space. That’s because a press release, like a speech or a press conference or a Youtube video or a tweet -- is nothing more than a tool to help influence the audience (s). How or even whether you use it depends on the circumstances of any particular situation. A press release can be a full page, or it can be a single sentence -- think 140 characters -- as best fits your communications objectives and the information-receiving preferences of your audience. All it need do, ever, is to address the basic tenet effective communications: the right message, to the right audience, at the right time, using the right spokesperson and vehicle or channel. So, if you have a story to tell, don’t automatically think “press release” -- but don’t automatically rule it out, either. When I was starting out in the profession, the conventional wisdom was to always remember that the reporter is not the audience, and that our goals was always to advance our message regardless of that the journalist wanted to do. That’s not so easy anymore. So for me, the question worth contemplating is the extent to which the rapidly evolving nature of journalism is influencing the impact of the press release. Traditionally, journalists were filters -- now they are fundamentally part of the audience; and they are not simply ‘reporters‘ in the traditional sense but also commentators. But when all is said and done, no matter what vehicle we use, we must always be compelling, credible, reasonably concise and consistent in our messaging. So even if you have a ‘good’ story to tell, a story that should be of interest to your audiences, that may not be enough to break through the noise and chatter. How can you turn a good story into one that will truly motivate and compel members in your audience to respond or react the way you want them to? One time I saw a guy wearing a T-shirt with Einstein’s photo on the front. Underneath the photo was text that read... “It’s not just a Good Idea...” On the back of the shirt were the words, “It’s the Law.” That got me to thinking about what those of whose in Strategic Communications and Public Relations can do to help our clients break through the clutter with a compelling - as opposed to simply a good — story. A little passion, energy and enthusiasm can help turn whatever it is you’re ‘selling’ into a truly marketable product. For example, supporting research programs for high school kids at a school like Thomas Jefferson High School for Science & Technology is not just a good idea. It’s crucial to our regional and national competitiveness and contributes to our national security. Why? Because future global competitiveness demands that our nation produce bright future leaders in STEM (science, technology, engineering and math). We all have a vital stake in the successful education of these (and all!) students. Likewise, the campaign to end homelessness in Fairfax County, where I live, is not just a good idea. It’s essential to maintaining the quality of life and economic well-being of everyone. Why? Because homelessness affects more than simply its victims. Homeless kids can be disruptive in school and/or underperform. The homeless can fall prey to crime. Emergency room care or medical treatment for the homeless is costly to all taxpayers. We all have a vital stake in ending homelessness. And finally, ensuring a reliable source of financial credit to farmers and ranchers is not just a good idea. It’s essential to our ability to feed our nation and many others around the world affordably. Why? Because agriculture and ranching are extremely capital-intensive, and also subject to the vagaries of nature and market demand. We all have a stake in a financially-strong rural sector. These are just a few examples of work I’ve been doing with clients. Together we are pushing the boundaries of their efforts to the highest moral plane, while being sure to maintain and protect the credibility of our messages. Readers of this space know how I feel about NOT “thinking outside the box.” Passion, energy and enthusiasm are part and parcel of the core principles of effective communications. Knowledge is Power. But Information is not Knowledge — and sometimes it isn’t even Information. The terrorist explosions and shoot-outs in Boston Cambridge and Watertown will, over time, inform us helpfully in anticipating future such attacks and inform us valuably in the anticipation of future attacks. A significant lesson for those of us who are interested in the achievement of effective communications has been the obvious, simple and yet profound re-discovery of the essential fact that credibility, the foundation on which we must rely if we are to convince audiences to respond favorably to our messages, is entirely dependent on being right....on being accurate. As this is written, journalists of the mainstream type and active new-media journalists are lining up, on after the other, to acknowledge that their reports, their posts, their tweets on the developments in the Boston Marathon attacks were premature at best, wrong at middle, and counterproductive to the capture of the bomber at worst. In public relations, we cannot rush to be “first.” We cannot rely on hearsay, conventional wisdom, common sense or conspiracy theory - no matter how many questions apparently cannot be answered satisfactorily at a particular point in time. For those who depend on the confidence that our communications strategies and messages are credible and compelling, the takeaway from Boston is to make sure that our information truly is knowledge. POWERPOINT: WE HAVE MET THE ENEMY AND HE IS ... US. Powerpoint calls to mind the Churchill quote: “Democracy is the worst form of government except for all the rest.” As with democracy, the key to success in Powerpoint depends almost entirely on how carefully we manage it. A strategic approach is best. Given an opportunity to present our ideas to a group, too many of us reflexively begin to “build a deck.” But why? Do yourself — and your audience! — a favor by walking yourself through the strategic process of creating an effective presentation. PERSUADE. The ultimate goal in all communications is to persuade the audience to respond in your desired way. Therefore, your message must be credible, compelling, and consistent — but it also must be absorbable by your audience. Whatever you create, be it a press release or web content or a tweet, or a presentation, your message must not only be delivered but also received. DEFINE. Your presentation is only nominally focused on the topic you have been asked to cover. In reality, the presentation is an opportunity for you to demonstrate that you are a leader in your field, that your own organization is vital and relevant, and that you bring important value to your audience. So, if your audience expects, for example, a “progress report,” deliver your message in such a way that helps advance your own mission and objective. To SLIDE or Not to SLIDE. It’s not an oversight that we arrive at Powerpoint only in the fifth paragraph of this post. Too often, we use our slides as a crutch — as “notes for ourselves.” Yet the purpose of slides is to amplify and support the message we want to deliver. Wordy slides and graphics don’t help the audience absorb our message — they complicate their ability to do so. And after all, aren’t you the subject matter expert? Why do you need a crutch at all? Next time you are planning a presentation, don’t think of it terms of slides. Think of it in terms of delivering the right message, to the right audience, using the right tools and format. This post is not about the appropriateness of the name, “Redskins.” And it’s also not about how the team may have mismanaged its star quarterback. Instead, what transpired in the recent NFL game should remind us all that the strategic principles of effective communications apply also to decisionmaking in business (in this case, sports). That is, all our activities — whether they be writing web content or deciding whether to punt — must relate back to a larger objective if we are to mazimize our effectiveness. Coach Mike Shanahan lost sight of his objective when he failed to remove his injured QB from the game. As a result, he lost his most valuable asset for a long time, and his decision almost certainly cost his team the game — and, yes, wait for it — the Super Bowl. The objective of every NFL team is to win the Super Bowl. The way a team wins the Superbowl is to win as many games as possible. A win is a win is a win, no matter how close, how improbable, or how ugly. The way to win as many games as possible is to always try to put your team in the best position to win the game. Regardless of the pressures of the ‘heat of battle’ and an emotional tug-of-war, by allowing an obviously ineffective and injured leader to remain the the context, the coach failed to put his team in the best position to win. Those of us who practice communications constantly remind ourselves that if we lose sight of our client’s objective, we are almost certain to wander away from our strategy, engage in tactics that might seem fun or hip but that do not advance the objective, and expend resources unnecessarily, all the while not fully maximizing our ability to achieve good results. Even when preparing to write a seemingly routine press release, we should stop and ask ourselves, “Is this tactic the best way to advance my client’s cause?” Only in most extremely egregious cases are we likely to harm the client’s ‘franchise,’ but if we do not stay true to our principles we certainly won’t put them in the best position to win. This Year, Everything is Political. Everything. That’s Why We Have to Stay on Message, Folks. I love old movies; one of my favorite character actors was Charles Coburn (father of James). Typically he played gruff older men with a hidden heart of gold. You can imagine my disappointment when I discovered, upon reading his bio, that he had actively engaged in helping to blacklist other actors during the Red Scare. Why did I have to know that? And why do I have to know that Charlton Heston was very conservative and that Edward Asner is very liberal? Or that Jon Voight used to be liberal but now is conservative? The political leanings of these actors are no more our business than the religious beliefs of Dan Cathy of Chik-Fil-A. This is America, after all, and actors and leaders of businesses — especially particularly private businesses such as Chik-Fil-A, should be able to speak freely. But as we all learned from the brouhaha involving the Komen Foundation (see my previous post), a public and vocal position on a hot-button political issue carries with it immediate and and potentially serious consequences. I have eaten at Chik-Fil-A; their sandwiches taste good to me and if there were a convenient location near me I probably would visit it from time to time. But as a communications professional I would not be able to do so without recognizing how thoroughly Cathy scrambled his hard-earned brand. The boycotts organized by people and groups offended by his comments have nothing to do with bad chicken, tightly caged birds, or underpaid employees. The support organized by others has nothing to do with the food’s quality, taste or affordability. From now one, millions of Americans will make a decision whether to eat at Chik-Fil-A at least in part on the extent to which they share Mr. Cathy’s views. Not long ago Mr. Cathy tried to get back on message when he said: “We’re not anti-anything. We just want to create raving fans.” Raving, yes, but now also raging. Stay on message, everybody. Strong words. After all, Komen for the Cure is still ‘in business.‘ In the wake of public outcry the organization has parted ways with a controversial personality and made clear its intention to listen to and work with its affiliates, allies, and donors to restore and maintain support for its vital mission. The annual “Race(s) for the Cure” will go on as scheduled, and thousands of men and women will continue to participate — albeit, apparently, in lower-than-normal numbers. But we won’t ever be able to look at Komen in the same way we did before the uproar over its relationship with Planned Parenthood. And by “we” I mean to include conservatives and liberals alike, Republicans and Democrats, independents, socialists, TeaPartiers. I mean everybody. The Komen “brand,” as we knew it, has been destroyed. Can a new brand be built? The brand attribute I’ve always appreciated most about Komen was that, since its inception, it stood for one thing and one thing only: the advancement of research to eradicate breast cancer. Wear a pink ribbon and raise some money. Simple. Easy. Clean. Unique. Anyone who cared to pay attention would know that founder Nancy Brinker is a Republican who held office a Republican Administration. It didn’t matter, because Komen’s brand was completely nonpartisan. But now it does matter — and it would matter also were she to have been a Democrat, because one could argue, I suppose, that Komen should not have been supporting Planned Parenthood in the first place. One need not have any opinion about the pros and cons of this relationship to understand that, in an era of deep political divisions, in a year of a fiercely partisan election, Komen made a decision — apparently without benefit of a communications strategy (!) — that inevitably inserted it squarely into the center of the most intractable and divisive issue of our time. As a result, the Komen brand —once so clean, so clear, so distinctive — has been obliterated. No matter what course of action the foundation decides going forward, it will be viewed as ‘picking sides.’ Rebuilding the brand, if indeed that is even possible, will take a very long time indeed and will require much more internal upheaval within the organization than we have seen to date. I cannot tell you how many times the young up-and-comers at Powell Tate and Porter Novelli would say to me and other more experienced professionals: “Please tell me how to be strategic.” It was as if there were a secret handshake. Yet there is no mystery to strategy or strategic planning, for both management operations and communications. And there definitely is no “thinking outside the box” (see our posts for March and May 2011). The procedure for creating a strategic plan for a communications program is the same as the planning for an organization itself, with the point of departure being only that the former focuses on how the organization conveys information about its operations to its audiences. In the simplest terms, a “strategy” is the overall approach that one will follow to fulfill an organizations’ mission and objectives. And “strategic planning” is the process in which we clarify the overall purpose and desired results of an organization, and how those results will be achieved. In other words, where do we want to go and how — broadly speaking — are we going to get there? For management operations, the planning process usually covers the entire organization or is aimed a major function. In communications, the process is intended to ensure that all public relations, public affairs, and marketing activities match up with the overall objectives. Essentially, there are three elements to the strategic planning process: analysis, goals, and action steps. In the analysis phase, we examine the ‘universe’ in which the organization operates: Examples are: What are the demographics of our customers; what do we know about what they want/don’t want; who is our competition and what are they doing? This phase often contains an exercise known as SWOT — the identification of the organization’s strengths, weaknesses, opportunities and threats. When it comes to planning, the organization has to decide what must be done to achieve its objectives. These goals should be fairly specific and realistic. Identifying the action steps includes establishing the specific tactics, that is, the specific activities (examples include press releases, content for the website, speeches and presentations, fact sheets). Operationally, examples include launching a new product, hiring/layoffs). Ultimately, work plans are developed to implement specific goals. This phase also establishes who will be responsible for accomplishing what goals, and the timeframe for activity and how the strategy and implementation will be evaluated. When campus police used pepper spray to break up a student sit-in at UC-Davis, who had the story first? The local paper? CBS? No. As blogger Jeremy Scott points out on reelseo.com, “YouTube Killed the Evening News” on the UC-D story. Scott asserts that “YouTube drives the news now,” not TV reporters. “The evening news no longer creates content, they just curate the news content of larger organizations (AP) and the Internet,” Scott writes. Is he right? Well, he might be just a bit too dismissive of network and cable TV, but we can say with certainty that he’s NOT wrong. Most Mainstream media and public relations practitioners likely are not surprised at what happened here. We have known for a handful of years that social media drives profound change in our respective endeavors. Some of the most interesting reporting and commentary in The Washington Post, for example, isn’t even in the newspaper, it’s on the website; and whatever little we may know about what is (or is not) happening in Syria, for example, comes to us via social media. UC-D officials understand this — now — and I hope they have secured PR counsel. The administration suffered a second hit to its reputation when, in the wake of the spraying, Chancellor walked awkwardly to her car as hundreds of students looked on in a silent protest vigil. How do I know? I saw it on the always-on world of YouTube. “That’s a great story — let’s put a face on it!” For decades, public relations professionals have relied on this expression, which simply means that the telling of a good story, complicated or not, will greatly be enhanced if a visual is employed. And that’s why he had to go. Immediately. And yes, by telephone, at 10:00 pm. at night. I leave it to others to judge whether the Board of Trustees did the right thing; they did the only thing. Negative publicity can ruin our day. Extended negative publicity can ruin an individual. The remarkable confluence of circumstances surrounding the events at Penn State threatened to ruin Penn State’s reputation — and not simply the football program — for years to come. Penn State itself was in grave danger of becoming the “face” of the college scandal to perhaps end all college scandals. The fact that Coach Paterno became the face of Penn State may or may not have been the Grand Design of a PR guy. But it sure made the trustees’ job easier. “Innovation Today for Better Health Care Tomorrow.” Just a catchy slogan for the Medical Device Manufacturers Association, right? Well, no. MDMA’s theme allows the organization to define itself on its own terms and enables to better manage the reputation of the industry. A universal theme can help drive your company’s business success, as well. The most common communications challenge facing entrepreneurial organizations is that they lack a coherent, cohesive strategic approach to communicating information about their business, culture, people and products. Too often the attitude is, “If-only-I-could-just-tell-you-everything-about-my-company-then-you’d-understand-and-you’d-buy-my-product. But our audience’s interests often are narrow, and they have other things on their minds. A well-chosen universal theme is the first step in building a communications program that will have a positive impact on your business. In just a few words, a theme evokes the many attributes and benefits of your company and its products. And if you employ the theme consistently, in concert with well-organized, concise supporting facts and information, you will build confidence that your audiences — customers, legislators, regulators, prospects will absorb and react to your information as you intend. “The Power to Make It Better.” Millions of Americans view AARP as the protector of Social Security and Medicare. Others rely on AARP for health insurance and mail-order prescription drugs. Millions more see AARP membership as a way to obtain discounts on products and travel. This theme allows AARP spokespeople to communicate the association’s clout (“the power”) on behalf of older Americans in many diverse areas. MDMA’s theme — created by Tom Goodwin — is a real workhorse. In seven words it enables the association to deliver a broad message: MDMA member companies are much more than manufacturers of medical devices: they are forward-looking researchers, scientists, inventors and entrepreneurs who recognize that the health of patients always comes first and that innovation drives important implications for quality and cost — not simply price. And with this theme, MDMA itself easily can communicate its advocacy for innovation in technology, in medical practice, in operations management, in reimbursement policy, in federal and state law, and in financing. As a practical matter, a universal theme provides the common ground on which everyone who may be called upon to represent your organization can build their own story. It is so much more than just a slogan: When backed up by informational material (fact sheets, FAQ, etc.) and training for your spokespersons, it provides a new avenue to enhanced business success. does your story pass the "c" test? Be Credible. Without it, we have no story — or, at least, not one worth telling. At this writing, New York Representative Anthony Weiner has more than just an “embarrassment” problem: he is in trouble with his colleagues and constituents at least as much because he is seen to have lied and dissembled about his actions. And even though Lebron James is undeniably a terrific and often dominant player, he has some words to eat — and a few titles to win — before his credibility is fully restored. Savvy leaders and execs who like to engage reporters in the exchange of information for mutual benefit and gratification also know that the relationship is not based on common interests or friendliness, but credibility. ✓	Always endeavor to thoroughly ‘vet’ your messages — fact-checking and gut-checking — before passing them along to your audiences. Be Compelling. How is that in an age when everyone has at least one personal communications device that is with them at all times, that no one ever actually answers the phone? When’s the last time you actually got someone to pick up? There is a reason: They’re busy! And so are your audiences — busy and distracted with issues and challenges of their own. So if you want your story to be heard, absorbed and reacted to in the way in which you intend, it had better be good. Oh, that doesn’t mean your message have to be blockbusters. But they do need to advance the discussion in your space in a substantive way. Be Concise. There is no way to make a technical ‘white paper‘ truly concise. But it can be reduced to non-technical language that will satisfy sophisticated audiences. And that’s the point: Take only as many words as are absolutely necessary to convey the thrust of your messages to the appropriate audience. Years ago the catchphrase was, “dumb it down to the sixth grade level.” But today’s audiences are too diverse and disparate for that. Say your peace and shut up. Be Consistent. It remains to be seen how history will view President Obama’s campaign themes of “hope” and “change,” but one thing is certain: he was vastly more consistent in his messages than his worthy opponent. Consistency is important in messaging for the same reason that the ability to be concise (see above) is important: Our audiences are busy and distracted: Give them the same themes and messages over and over again, and your story will begin to take. To maximize the chance that your messages will get through, all four “C” words have to be operating on all cylinders. Lose credibility and it doesn’t matter whether you are consistent in your delivery. Lose consistency and it doesn’t matter how compelling your story is, no one will be able to remember it (blockbusters, by definition, will sustain themselves, but they are the exception that proves the rule. If you’re not concise, your audience likely will tune you out. And if you story is not compelling, well, it doesn’t really matter how consistently and concisely you explain it, now, does it? One hears the expression so often it has become a cliche. Maybe it’s true in some endeavors, but it is emphatically NOT true when one is interested in using communications to seize control of one’s reputation or image. There was much debate over whether the United States should release photos of Osama bin Laden. On the one side were those who believed that releasing the photos would “prove” that the terrorist was, in fact, dead. On the other were those who feared the photos would have an inflammatory impact. Both sides may be right, but from a strategic communications point-of-view, they are beside the point. The reason to not release the photos is because there was no clamoring or outcry to do so. Only a tiny handful of conspiracy theorists suggested that his death was faked. And within a week, al Qaeda itself acknowledged it. In stark contrast stands the President’s decision to release his birth certificate. Arguing for release were those who wanted to put the issue to rest. Arguing against were those who believe that the Birther community would not have believed it anyway. Both were probably right, but the strategic communications rationale for releasing the document was that the business of government was on the verge of distraction from its pursuits because of the constant public discussion. While the entire incident is regrettable, Obama did what he needed to do. One tiny distraction does not beg a reaction; continuous loud noise hampers the ability of organizations and individuals to complete their missions. Public Relations is a discipline — not an art, or a science — that demands adherence to an overall business objective or mission. As a result, effective Public Relations is for all practical purposes a support function that reacts, responds to, and anticipates communications issues associated with the fulfillment of the objective or mission. As a result, the most effective and compelling messaging and creative strategies and tactics — even those that one might be tempted to characterize as being “outside the box” — are in fact wholly connected to and dependent upon the factors that will determine whether communications activities can actually help achieve the objective or the mission! What is the surrounding atmosphere or environment in which an individual or organization strives to achieve success? What audiences must be reached, convinced and motivated if we are to be successful? What messages best resonate with both the achievement of our goals and with the audiences we must have? Which of our leaders (or members, or other individuals) are best-suited to deliver our messages effectively? In the electronic communications age, “Facebook” and “Twitter” represent the very latest in so-called “outside-the-box” thinking. But if your audience relies on and reacts to Tweets, then it’s not outside the box at all. Just don’t try it with anybody older than Tom: That would be completely outside the box! Will Conventional Wisdom Fail Tiger – and the Public Relations Profession? It may be too late, but for Tiger Woods and his crumbling image, it didn’t have to be this way. Crisis experts joined hands with reporters and bloggers in their assertion that the only way Tiger can move ahead would be to come clean in some major media forum about the specifics of his alleged serial cheating: Oprah, Larry King, you name it. A Washington, D.C. radio station polled its listeners on “how” and “when” Tiger “must” tell all; the option for him to remain silent was not, apparently, a consideration. They are wrong, and I hope Tiger isn’t listening to them. The mid-1980s Tylenol crisis is recognized as the watershed moment at which sound public relations strategies became recognized for their effectiveness and value in turning a bad situation. “Getting out in front,” “coming clean,” and other mantras touting full and prompt disclosure became the accepted new standard for crisis management and response. But the Tiger case should serve as a cautionary tale that effective strategies are not a one-size-fits-all proposition. While most of us are of us are familiar with the success of McNeil’s Labs’ handling of the Tylenol tampering case, how many of us remember that the primary reason the company’s strategy worked was because it hadn’t done anything wrong? Some creep tampered with Tylenol capsules in a store; nasty, but not the damnation of a product. Tiger has done something wrong. But what is the profound public interest in his case? A golf cheating scandal? Not that we know of. A serious injury that will prevent him from playing in the future – with all the attendant financial implications? Not that we know of. Apparently, what Tiger has done is to serially cheat on his wife. In other words, the clamoring in the media and elsewhere is for Tiger to bare his soul publicly about the one thing – the only thing, actually – that is nobody’s business: his private family life. Am I the only one who doesn’t see a mass media soul-baring anywhere here? Tiger should first figure out his objectives (Do I want to play golf? Should I be married? Do I want to retain my endorsements? Do I care about being popular? and his perception of the existential threat to those objectives. Next, he should identify his most crucial audiences, and the relevant messages: Elin and other family members, his sponsors, PGA Tour officials who have an abiding interest in Tiger’s role in golf, and the like. This is a huge mess, all of Tiger’s own making. The clamor won’t go away easily or soon. Inevitably there will be a press conference at which it will be demanded of Tiger to tell “how many, how often, where, why, and for how long.” But isn’t that what media training is for? Likewise, ultimately his wife may demand a public apology; his sponsors and the PGA may do likewise. In these eventualities I’d insist once again that he review his objectives. It is possible, after all, that Tiger may decide that he can still play golf well, earn plenty of money even without endorsements, and support several girlfriends, even while enduring catcalls of public disgust among tournament crowds. Hey, I didn’t say this would be easy. Tiger should answer any golf-related question that comes his way – even questions about whether the stress of his situation will affect his play and earnings potential. But “coming clean” about his private life will not solve anything: it may, in fact, destroy his career and damage the golfing profession. Did Obama’s PR Skills Abandon Him in Health Care Reform Debate? Furious partisan politics obviously drive the contentious national debate over President Obama’s health care reform initiative. But the president could have saved himself, Congress, and the rest of us a lot of grief had he followed his previous – and proven – strategic approach to framing public debate. When the subject of race relations became the elephant in the living room during the 2008 presidential campaign, Obama delivered a speech even his detractors found compelling and eloquent. While the issue of race has not (and never will) go away entirely, public discourse now typically occurs in a “post-racial” context. He set the tone. Likewise, Obama seized the initiative with Muslims, again framing the debate on his own terms and sending a clear signal that future relations would occur in the context of his willingness to extend his hand. And when Defense Secretary Gates decided to end production of the F22, he and Obama once again set the tone for debate by reminding everyone that A) the fighter won’t be much help in fighting future wars and B), oh, by the way, the F22 has yet to sortie a single mission. But when it came to health reform, political considerations trumped effective communications. Instead of reminding Americans that our health care system is at once the most expensive and least-performing in the entire world, and that any nation that prides itself on being “Number 1” must find a way to protect all its people, he instead turned the messaging to Reid, Baucus and Pelosi – fine leaders all but none remotely as eloquent and compelling as Obama himself. None of this is to suggest that had Obama set the tone, the health care debate would have been polite and pleasant. No way. But had he followed his earlier instincts, every raging disrupter at a town hall meeting and every congressional critic would have been forced into opposing not “socialized medicine,” but rather a strong and healthy America. Now it’s too late.